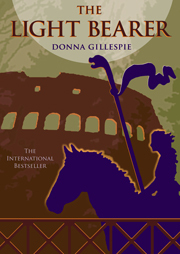 The Light Bearer, Donna Gillespie's epic novel of ancient Rome, is now available as an E-book on Kindle, Nook and iPad. This latest edition has been revised by the author, and includes a Note on the Revised Edition, plus a new Afterword by Donna Gillespie. "Throughout this monumental story, Gillespie constantly increases the excitement and intrigue. There are no flat passages in THE LIGHT BEARER, only a fast-flowing stream that erupts into a full-scale torrent at the book's conclusion."